(From left) top three winners of the 169 & Below Megalanes Skins Challenge Grand Final, Isa Kumar, Azree Abdul Rahman and Mohd Izam. KUCHING: Azree Abdul Rahman knocked down a total of 1,678 pins to win the 169 & Below Skins Grand Final at Megalanes Adventure World, King’s Centre on Friday night. He also shot the highest game of the night with his 277 score in the last game of the nine-game final. 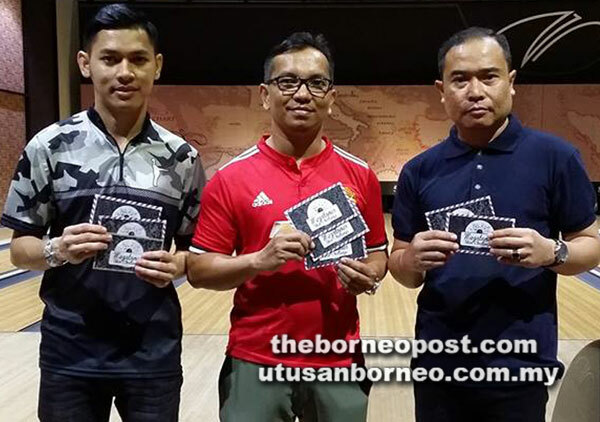 A further 130 pins behind Azree in second place was Isa Kumar who accumulated 1,548 pins while Mohd Izam had to settle for third place with 1,488 pins. In fourth place was Mohd Radzri with his total of 1,470 pins and 14 pins behind Radzri was Ayden Phang. Muhd Idarie and Pandetar Zin finished in sixth and seventh positions after registering 1,439 pins and 1,432 pins respectively. Meanwhile, Patrick Naga, Awang Muhd Azizul, Kamil Anis, Thomas Yap and Khairul Annuar capped the night in eighth to 12th positions.